These are some commonly-asked questions about reducing the running noise generated by PCs. If you have any more questions which are not listed, please ask! How can I tell which is the noisiest component within my PC? I have just installed my new CPU cooler but my PC is not detecting a fan, what can I do? My PC chassis uses sliding drive rails to mount drives. Can I attach these rails to your hard drive acoustic solutions? My hard drive has a "breather" hole which must not be covered. Can it still be used in an acoustic enclosure? The cooler I purchased came with a variable fan speed controller. How do I know what speed to run the fan at? I have a branded server (HP, Dell etc.) - can you make it silent? Do you supply any components to silence SFF (small form factor) PCs such those made by Shuttle? Do you supply built PCs already silenced? Does it really matter that my PC makes noise? Will I have to buy new silencing products if I upgrade my PC? Do you have any products for Macintosh computers? In order to ascertain where the noise is coming from there is a very simple test you can carry out, just take a pencil or plastic pen lid and 'stop' momentarily each fan within the PC, including the PSU. If the noise stops/reduces you have located the offending component which would benefit from replacement with a quiet alternative. Yes, there should be no problem attaching any of our hard drive solutions to drive rails. Just keep an eye on the temperature of the drive for the first day or so after installation, since heat dissipation from the acoustic enclosure into the PC chassis could be slightly reduced compared with mounting the enclosure directly using screws. Most hard drives have breather holes which prevent pressure differences building up inside the drive. The inside of the drive enclosure will not form an airtight seal on the drive's breather and therefore will allow it to work as intended - to eliminate any possibility of pressure build-up. In summary - there is nothing to worry about! It's possible that the power supply may be faulty, but here are some simple things to check. Firstly, a power supply will not work if you simply plug it in and flick the switch. The power supply will only turn on if you connect it to a working motherboard and associated items (processor, memory, video card, etc). It is actually the motherboard which tells the power supply when to switch on. Secondly (if applicable), check the voltage is set correctly to 115/230 volts depending on what country you are in. Thirdly, if possible it would be good to try the power supply in another PC to see if it works, or try another power supply in your PC to see if that works. You can then tell whether it is the power supply which is faulty or the actual PC itself. If all else fails, please contact us for further support, and/or return details. Your existing power supply will be designed to run with a specific amount of airflow in order to adequately cool the components inside and reducing the airflow may lead to overheating and damage to the power supply and/or PC. All PC power supplies contain very high voltages and even with the power disconnected, the voltages stored in the capacitors can be easily enough to kill. It is not recommended to take the cover off any PC power supply for this reason unless you are absolutely confident of your own ability. Because of the grave dangers involved, all PC power supplies by law carry a warning label forbidding removal of the power supply case. 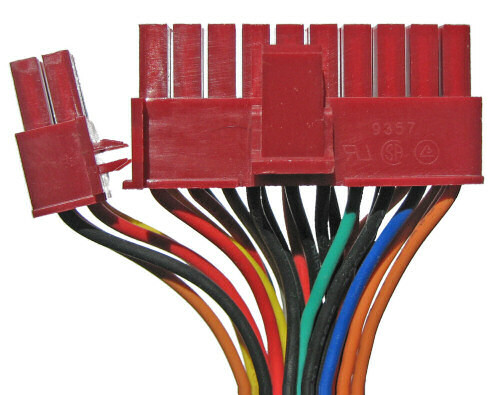 There will be no standard PC fan connector inside the power supply to use to connect a replacement fan, and it would probably have to be soldered directly into the PCB inside the power supply, or have a specialist power connector attached. This can be a tricky operation to say the least. Please consider the above points very carefully before proceeding with an operation to replace the fan in your existing power supply! The best answer we can give to this question is to go ahead and take an intelligent "guesstimate"! There are no hard and fast rules about what size of power supply any given PC needs as a minimum. Our advice would be that if you are replacing an existing power supply, then consider a new one at least of the same wattage as the old one. In addition, if you wish to build in a "safety margin" to allow for reliable running and possible future upgrades, consider adding 100-200 watts to the rating of your existing unit. TDP stands for Thermal Design Power and this refers to the amount of heat (in watts) which the CPU (central processing unit) will dissipate when running at full load. Sometimes processor coolers are specified as being able to cool processors with a maximum TDP of a certain value. Essentially, TDP is a measure of how hot a processor runs. Electrically, there is no problem doing this - the fourth pin on the fan cable is used purely for PWM control and is not needed in order for the fan to run. So you can plug the 4-pin fan connector onto the 3-pin motherboard fan header, leaving the fourth pin not connected to anything. The fan will potentially run at full speed, so if you would like to reduce the speed of the fan you will need to adjust the fan speed setting in your BIOS or use fan control software such as SpeedFan in Windows. When you first install your new CPU cooler we recommend that you run its fan at full speed to ensure that everything is working properly and the PC boots successfully. Then you can turn the speed controller's knob down to its minimum setting and appreciate the difference in noise level! Most people prefer low noise rather than maximum cooling for everyday computing, so clearly it makes sense to turn the fan speed controller to its minimum setting and see how it goes. If you are running your PC in a particularly hot environment, or if you are experiencing stability issues then try turning the speed up slightly for more cooling. Generally speaking, virtually all the coolers we sell will adequately cool any modern processor at their minimum fan speed setting. However, if you want to be 100% sure that your CPU is in no danger of overheating, then you can check its temperature in the BIOS setup (press Del or F2 etc. when you first switch your PC on, then look for the CPU temperature reading in "Hardware monitor" or "PC Health Status" option or similar). The resistor cable (also called Ultra Low Noise or ULN cable) is designed to allow the fan to run slightly slower for even quieter operation. The benefit in lower running noise is significant. Although the airflow will be reduced slightly, this usually has minimal effect on PC temperature. We would generally recommend using the ULN resistor cable for best results in almost all circumstances. Hold the fan so that the round fan sticker is facing you. You are looking at the rear of the fan. When you plug the fan in, the air will be blowing towards you. If you want a fan to act as an air intake, then the fan sticker will be facing the inside of the case. Some fans also have two small arrows moulded into their plastic housing - one arrow shows the direction of airflow, and the other (at 90°) shows the direction of blade rotation. The size of fan you need will generally be determined by the size of the fan fitting position in your PC case. The sizes of all the fans on our website are shown as measured along any one of the fan's four sides, NOT the distance between the fan's screw holes! Our most popular fan size is 120mm, followed by 80mm. This isn't really dictated by customer preference, but more by recent designs of PC cases. As for the thickness (depth) of the fan, generally 25mm (1 inch) is by far the most common depth, although smaller fans can have shallower depths such as 15mm or even 10mm. All our fans are 25mm thick unless otherwise stated. If you have any questions about which fan you should order, please don't hesitate to get in touch. Since summer of 2011, we have supplied complete PC systems as an alternative for customers who prefer not to upgrade their existing machines. Our computers are top quality, high performance and of course easy on the ears! You can use our website system configurator to specify your preferred choice of components, and if you don’t see exactly what you want, we would invite you to make contact and give us the opportunity to build a complete machine to your exact specification. Maybe you care, maybe you don’t! Generally most people only care about the noise generated by their PC if the room is normally quiet with the PC switched off, because then they really notice the PC noise more. Of course there are other people with specific reasons for needing or wanting peace and quiet, such as musicians, tinnitus sufferers and hi-fi enthusiasts. The strange thing about background noise is that you only notice how intrusive it is when it stops. Probably not, because virtually all the products we sell can easily be removed and re-used. Assuming the components in your new PC are compatible, our products can easily be re-fitted for many more years of further enjoyment!